Greetings to All, and Happy New Year 2019 from TruthBook.com! It has been awhile since we've communicated with you - and with good reason! Since our last announcement in May 2018, our team has been busy putting together a fabulous new Jesus book for publication in April 2019. The book is titled Jesus: The Untold Story. A Modern Biography from The Urantia Book. This is a project that has been a decade in the making. It began as a dream of creating a book that would showcase newly commissioned paintings of Jesus’ life inspired by the Urantia Book. Please have a look in our Religious Art Gallery where you can see the whole collection to date. Over the years, we have sent you announcements with the arrival of each new work; today, we continue this effort. Towards the completion of the book, commissions that were underway - often for years, arrived in time for the book’s publication. There are 11 new and exciting additions! As you may recall, prior to Jesus’ life on Urantia, he was given guidelines that were designed to help him understand what his conduct should be while living on earth; and he was also given additional advice. “To the end that you may not unnecessarily contribute to the creation of subsequent stereotyped systems of Urantia religious beliefs or other types of nonprogressive religious loyalties, we advise you still further: Leave no writings behind you on the planet. Refrain from all writing upon permanent materials; enjoin your associates to make no images or other likenesses of yourself in the flesh. See that nothing potentially idolatrous is left on the planet at the time of your departure." 136:4.2 The first thing Jesus did, after thinking through the general plan of co-ordinating his program with John’s movement, was to review in his mind the instructions of Immanuel. Carefully he thought over the advice given him concerning his methods of labor, and that he was to leave no permanent writing on the planet. Never again did Jesus write on anything except sand. 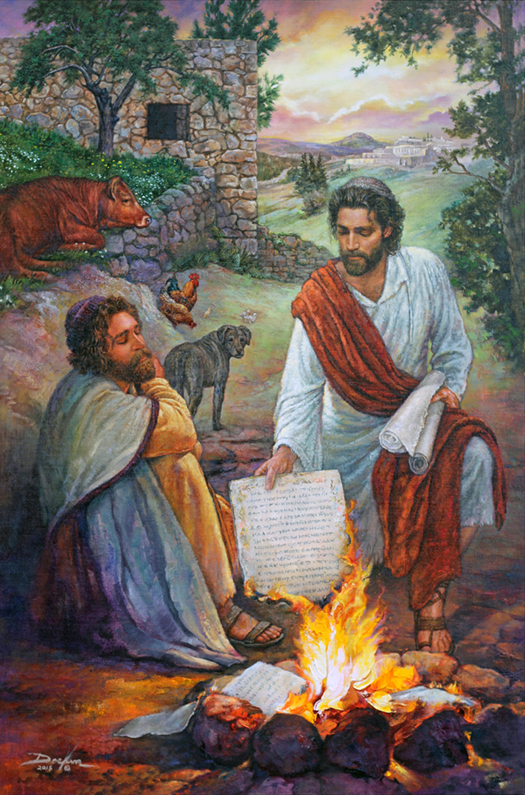 On his next visit to Nazareth, much to the sorrow of his brother Joseph, Jesus destroyed all of his writing that was preserved on the boards about the carpenter shop, and which hung upon the walls of the old home. 137:2.9 The associates of Jesus little understood why their new-found teacher was so concerned with completely destroying every vestige of his writing which remained about the home in the form of the ten commandments and other mottoes and sayings. But this proceeding, together with the fact that they never saw him subsequently write — except upon the dust or in the sand — made a deep impression upon their minds. It's easy to see the sad resignation on Jesus’ brother’s face as a determined Jesus destroys his writings. We feel a certain sadness ourselves, wishing that at least something of Jesus' writings might be seen today. But he was warned not to leave relics behind that would have become objects of adoration, profiteering, and worship in future generations. You’ll hear from us again soon because we have a backlog of new paintings to share with you, and new artists, too - so stay tuned!!! I love synchronicity (whether it is significant or not) and today I was just reading this very passage. The wisdom of the guidelines is obvious, how readily would "The Master´s Own Writing" been turned into objects of worship, religious relics and today I am sure they would sell them on TV and internet with a certificate of authenticity. Thanks to Russ Docken for using his talent to illustrate the life of Jesus! Anyone who has it in mind to become a politician, a preacher, or a teacher should keep this lesson close to heart. Can you elaborate? Sounds like you're saying that modern-day politicians, preachers and teachers should not put anything in writing ....? We can't make laws without writing them down and we can't teach children without reading and writing. Preachers, maybe, can get by without writing and perhaps they should; although a local church in my area has copies of the previous week's sermon available for those who weren't in attendance and I always find them interesting and helpful. I don't know why Jesus "left no writing" unto mankind, but I wonder about the wisdom of this intention. It is not the instructions of Michael's bestowal mandate, but rather the theory that true or actual religious progress is borne of the unconscious and therefore requires no images or doctrine as means of verity. Oh, but you DO know why! It's right there in paper 120, and in the original post that started this thread. Really? You wonder about the "wisdom of this intention" of Immanuel's pre-bestowal charge to Michael? You deem yourself more wise, then? 120:3.6 (1330.1) “5. As you may see fit, you are to identify yourself with existing religious and spiritual movements as they may be found on Urantia but in every possible manner seek to avoid the formal establishment of an organized cult, a crystallized religion, or a segregated ethical grouping of mortal beings. Your life and teachings are to become the common heritage of all religions and all peoples. 120:3.7 (1330.2) “6. To the end that you may not unnecessarily contribute to the creation of subsequent stereotyped systems of Urantia religious beliefs or other types of nonprogressive religious loyalties, we advise you still further: Leave no writings behind you on the planet. Refrain from all writing upon permanent materials; enjoin your associates to make no images or other likenesses of yourself in the flesh. See that nothing potentially idolatrous is left on the planet at the time of your departure. Children do not realise that, for instance, other groups that are highly analytical not only use published information to understand Jesus. There are groups and State-Actors, who purpose themselves to analyse all writing that others ever publish? The use of forensic accounting in the programme to provide every human individual a "personal tablet" whereby the maturation of the human individual is delinneated through User-Output (i.e. primarily writing). But in American Civil Beaurocracy, such User-Outputs are like a labyrinth. The stakes are so high that in the Mueller Investigation, one beaurocrat was dismissed for one snarky comment, which was recorded in the "private e-mail messaging" of "online conversation" with colleague. This is the "Brave New World" and parents should teach children the ultimate paucity/conservancy of mind: what an expert says on one topic is not just information pertinent to that particular topic but is also analytical data which reflects the psyche of such expert(Freud). So people are in fact, more than ever before, admonished to "watch what they say", to the extent which is extreme, that people with PhD are legally obligated not to espouse a philosophy which is believed to contradict the values established in medical science. Why Jesus left no writing? In my opinion the answer is in the negative. Judge not, lest others also refrain from judging you. The more and more one says, the more one reveals the imperfection of the maturing soul, and thus providing "weapons" to one's enemy, even if one does not know he even has enemies, by revealing facts and ideas which may be turned back on the person, thus "creating anxiety" on a later date, or sowing mistrust/doubt in the minds of one's colleagues as to the merit and eventuational success of such human individual as a team-member. The other reason why Jesus leaves no writing: wisdom supercedes any/all intellectual methods/means, since a wise human individual can fine multiple solutions to overcome the same issue. Why use a cookbook when you already know how to bake. But I believe this potential this is inherently obvious, so I didn't mention it. This tells me nothing about why you think "Anyone who has it in mind to become a politician, a preacher, or a teacher should keep this lesson close to heart." You gave your opinion about information security and privacy; and the idea that an expert doesn't need to read a recipe, they can cook based on their own knowledge (with which I agree). But, of course, no one can BECOME a professional chef without FIRST reading cookbooks and then writing down their own recipes as they are in training and as they teach others how to cook. Well I tried to explain it. As I have said my theory does not have to do with the bestowal protocol (even that is like a message in the sand!) But it had to do with "Judge not, lest you provide not unto others, that ammunition which may be used for judging you." OR do you at least see, that Michael living as archetypal man, in showing the pattern by which man ought to behave, indicates that Jesus believed man ought not to leave any writings. So if any man ought not to leave writing, how much more so is this true for those professions. So you think these professions should not put anything in writing because others might read it and judge them based on their writing? But isn't that exactly what those jobs entail? How will I know if someone is an effective teacher if I can't read anything they wrote? How will I know if a politician has appropriate ideas that I wish to support if the politician doesn't communicate a platform of positions on issues that I can read when I have time? How would I even vote for them if there is no written ballot?! And, if you believe that "that Michael living as archetypal man, in showing the pattern by which man ought to behave" means no one should leave any writings; you must also believe that no one should marry or have children. Thank you for your incredulity. Those questions although obsurd by today's standards, nevertheless indicate the demand of verity. The question is not how do we , recognise authority, but how does Children learn. Who is the one guiding the child the patient softspoken parent or the encouragement continually plodding and demanding parent. Am I suggesting that there is no merit to any of the Diplomas which you offer? In one sense, I promulgate the theory, that such affirmations of institutional standards quota are not ultimately necessary to the advancement of a society. Of course take that only as a matter of opinion. Or you can say, well this Ten Commandment slate, was necessary until so that man would become wise, but should man become wise then he should not let those ideas which once prospered his mind, to pose as any kind of detriment, so it could be broken, or as depicted obliviated. In the maturation of society, there is the conditional discharge for youths who become soldiers, for any priory activities they may have engaged in before becoming conscripted into the services of nationally-registered armies. Jesus as the keeper of the house of Joseph not only destroy the only writing but also conditional discharge the house of Joseph from the former tradition of Mosaic Law-Contract. Jesus set forward thereafter to make universal contract with mankind, expanding the contractual guidelines that Moses his predecessor offered unto mankind. Society institutions: the conditional discharge of certain ligitation, when humanity has advanced sufficiently so as to make the former regulations obsolete. Periodically, we are told, the scaffolding of chartres and social dynamics must be reordered and simplified. What are the narratives entering into the new treatises? They are often enough submerged within the legends of progressive institutions, no more than conflagrations of loosely affiliated individuals gathered with unity-of-purpose at the time, and the impetus of decision cannot be pinpointed. I say conditional discharge because it is like the way that most institutions are able to reform. "We have matured: let us not be hampered by the faults we have accused each other of in the past." Parents who are self-conscious enough to know that what the child is saying and doing reflects upon them. What an adult writes on the internet reflects what they are saying as a child. Every word every action is something that cannot be erased. Just as my niece is saying, that the public school teachers choose to use Google Classroom as a means of submitting their assignments into the cloud for the Admin, the teacher, to review. So you know there is a record that piles up for pupils such as she. Would you tell her to do thorough work, not neglecting any aspect of the assignment, while still being as succinct as possible. What about literature, free writing assignments, which are required of pupils: do you want them to publish their completed assignments into "the cloud", you know for the benefit of the global fourth industrial estate, or is the nature of such assignments too personal, so that the teacher would be required to review an hand-written copy? Should you teach adults to keep any introspective writing be kept in a private journal (if at all; if one does not trust the Adjuster's Record)? When a person is able to stand on their own two feet: will they resent that their parents neglected this aspect: personal speech and chivalrous conduct towards one's neighbours. If they are not actually hindered in their professional careers by the things they had done or claimed, they will at least be concerned by the prospect that it could hinter their socioeconomic careerpaths. Take this advice from me, one who has made mistakes, one who has hindered his socioeconoic careerpath by the things he has done and claimed. Is it wise to "join the movement", as Jesus might have joined the Zions? What groups you choose, intelligent youth such as Al Gore are very mindful in the way it helps them to find jobs in the future. It is a beautiful painting. Thank you for sharing it with us on the forum!